PORTSMOUTH, N.H. — “This is our starter home,’’ says Cathy Sununu, director of the Portsmouth Museum of Art, which opened just a year ago in 3,000 square feet of waterfront office space. Sununu, the daughter of John Sununu, former New Hampshire governor and White House chief of staff, and sister of former US senator John Sununu, volunteers as director and president of the museum’s board of directors — putting in “my 60- to 80-hour workweek,’’ she says with a laugh. The entire staff of the museum is, in fact, volunteer. Wall text for the works on display is provided — sometimes after prodding, according to volunteer curator Katherine Doyle — by the galleries and redacted by interns. The museum pays “a nominal rent’’ to Two International Group, the owner of Harbour Place, the multiuse building that houses it on the ground floor, according to Sununu. Partners in the company are also on the museum’s board. But if the Portsmouth Museum’s goals are modest, they have some things in common with those of the Institute of Contemporary Art when it opened in 1936: Show work by contemporary artists, reach out to educate the community about contemporary art, and leave the collecting to other museums (the ICA only started a permanent collection when it moved to its new home in 2006). They are, however, planning to move from Harbour Place to a permanent home. “We look at the seacoast here as an area where artists come to live and work,’’ Sununu says, “but there is no visual arts anchor.’’ She hopes the Portsmouth Museum will fill that bill. “We need to be a destination,’’ she says. “At the Edge,’’ the museum’s fourth show, is now on view. Organized by Sununu and Doyle, it is too all-over-the-place to identify any edges, but it’s jam-packed with gems. Contemporary art, almost by definition, pushes limits. This exhibit, then, makes a quick tour of just about anything that isn’t a traditional landscape painting: There’s abstract painting, conceptual art, street art, technologically advanced art, and much more. Big names such as Kiki Smith, Judy Chicago, and Tony Oursler mingle with those of regional and emerging artists. Chicago’s “Test Plates’’ from the 1970s, serving up the abstracted genitalia of notable women on dinner plates, were vanguard in their time, but now belong in the annals of feminist art history — or, if in a contemporary art show, the plates should be surrounded by work they have inspired, rather than lodged between an abstract painting and a “painting’’ made entirely on a computer, as they are here. Organizationally, “At the Edge’’ is catch as catch can. Sometimes, there are lovely confluences. Faith Ringgold’s “Bitter Nest #4 The Letter,’’ a sweeping, deceptively cozy-looking quilt, is outlined with text that tells a story of abandonment and family. It works perfectly in a small gallery (more like a corner office) with Boston artist Sarah Hutt’s “My Mother’s Legacy,’’ a collection of wooden bowls carved with memories about the artist’s mother, who died when Hutt was 13. Both pieces are grounded in craft and familial narrative. But why not group Ruud van Empel’s altered photograph, the vaguely creepy “World #11,’’ depicting a dark-skinned girl with doll-like, glassy eyes standing amid oversize leaves and spiky green stalks, with Ray Caesar’s photo-like digital images of children, which are equally unnerving? 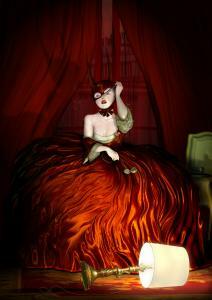 Caesar’s “Daybreak’’ depicts a girl in a voluminous red satin skirt removing a Batman-like cowl. Both push “at the edge’’ with technological manipulation, use of photographic-like imagery to create fiction, and the spooky deployment of images of young girls who seem anything but blithe and innocent. Sununu and Doyle have corralled work from galleries that represent internationally known artists such as Tara Donovan, who offers an untitled relief print made with rubber bands and filled with black swirls, and Smith, whose “Sitting With a Snake,’’ a lush digital print on silk (also made with cutting-edge technology), shows a woman seated atop a fat length of reptile. It sends a message that this is no local art association — the aim is to engage with high level contemporary art. But we’re reminded that PMA is an all-volunteer organization when we read the wall panels, some of which read like resumes and say nothing of the work on view. Smith’s wall panel describes two bodies of work in which she portrays St. Genevieve, but it turns out the woman in “Sitting With a Snake’’ has no connection to St. Genevieve. Other wall panels are deliciously informative, such as the one beside Portia Munson’s gorgeous photographic mandala, “7 Roses Surrounding Bat.’’ Munson scavenges her garden and the nearby woods each day, we learn, and shoots what she finds — in this case, several withering but still resplendent pink roses and the furry brown carcass of a bat. “At the Edge’’ is a ridiculously ambitious show, too thematically sprawling for such a small organization. Still, I have to give Sununu and Doyle credit for their ambition. The show doesn’t hang together, but it will dazzle and challenge anyone just dipping a toe into contemporary art, and that’s its aim.